There is often a marked increase in my Flickr stats when I post photos of exhibitions I’ve visited, but this year’s ExpoNG seems to have seen a particular bump. From feedback I receive it’s always good to hear that people are getting some entertainment out of them, and it’s perhaps worth mentioning that all the photos on my account are released under a Creative Commons licence which permits free re-use with attribution. Incidentally, Blogger’s dashboard indicates that this will be the 100th post on this blog. 2009 has been the most numerous year for updates since I started, although I don’t seem to have dwelt too long on any individual project. Plus ça change, plus c’est la même chose. I get the same effect when I post pictures from shows – and I contributed to your "bump" for the Expo shots ! It's nice and certainly encourages me to take and post galleries when I'm at an event which adds fun to my hobby. Your base level is fairly high, thought you do have a lot of interesting photos. I'm surprised how many views my photos from narrow gauge south 08 still get. 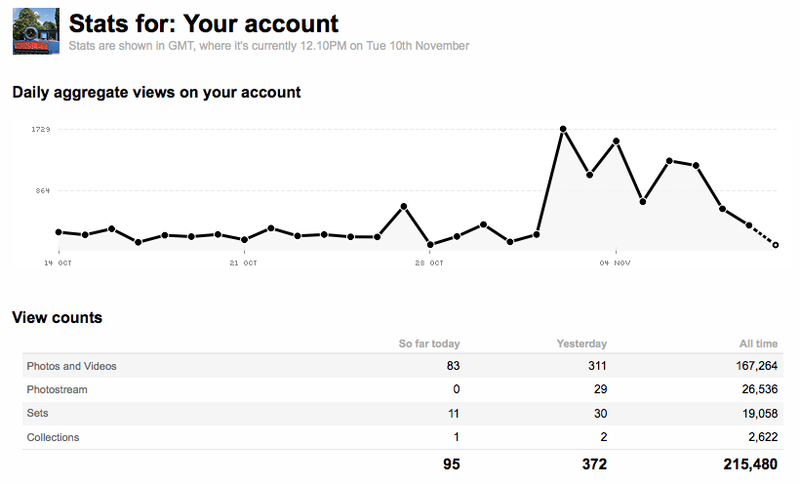 I had a bit of a spike in views of those post ExpoNG too – maybe people were in the mood for looking at exhibition photos! The consistently most viewed posts on my blog are older show reports too – guess that makes sense as it's all cumulative. I've noticed mine spike whenever I post modelmaking, which is very nice- there are a lot of modellers on Flickr and some great groups full of inspiration. Flickr also encourages me to take more photos of the real thing, which can't be bad. "For this relief, much thanks"